The 21-year old West Linn High graduate has turned hockey into education, and will play at Division II Franklin Pierce University in Rindge, N.H.
Quinn has been playing hockey since he was five years old. He got into the game right around the time that The Mighty Ducks movie came out. He and a friend decided to give it a try. His friend stopped playing after a year, but for Quinn, it turned into a passion. “I really loved the sport and couldn’t get enough of it,” he said. Some of the local teams he’s played for are the Portland Junior Hawks and Mountain View Mavericks. Once he was eligible for junior hockey, he faced a difficult decision: continue playing hockey, or focus on football? He had been a starting linebacker at West Linn High School. 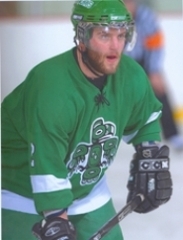 After choosing to stay on the ice, Quinn played primarily for the Seattle Totems in the Junior A League. He attended Inglemoor High in Seattle for the first semester of his senior year and returned to West Linn High for his second semester to graduate with his friends. Last year with the Totems was his best year yet, and Quinn enjoyed what he feared was his last year of organized hockey. Then, near the end of the season, it happened. The team was successful enough to be invited to the Junior A National Tournament in Boston, a mere 40 miles south of the campus. Quinn checked it out and felt right at home. “The campus is gorgeous. It’s a real woodsy area, it’s got an Oregon feel,” he said. At six feet, 200 pounds, Quinn is an imposing figure on the ice. A quick look at the stat sheet tells you he’s played the enforcer role – he led the team in penalty minutes his final season. A deeper look at the numbers shows that he’s more than just a goon. He was also in the top five on the team in goals and assists his last year in Seattle. The fact that FPU wants him to play hockey, rather than just beating people up, is one of the things that made their offer so enticing. Quinn will be moving out to campus at the end of August and starts classes in the fall. He couldn’t be happier about where his passion is taking him.